Hearts to the Rescue: *Richmond, VA- Disabled person forced to give up long-time Senior companion!! *Richmond, VA- Disabled person forced to give up long-time Senior companion!! 9-4-12: Harmony went to her new forever home yesterday! 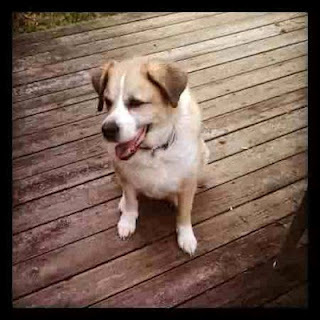 My name is Kim Sawyer, and I have the best dog named Harmony, and we need your help. I am disabled, and family circumstances have made it necessary for me to move to Virginia to live with my sister. My sister and I are moving in with her boyfriend of two years at the beginning of September. Her boyfriend has a 15 year old autistic son who cannot tolerate dogs. So, I have to find a new home for Harmony. Everyone who meets her falls in love with her, and she likes nothing better than a good tummy rub. She has been my salvation, and knows when I'm upset before I do. She always comes over to comfort me and when I cry, she holds my arm with her paw. She wakes herself up by letting out little barks in her sleep and then starts barking at the sound that woke her up, not knowing it was her. She tries to scratch her leg by sticking the whole thing in her mouth and takes food only when it’s placed in her bowl or given to her. She knows how to sit, lie down and come and walks well on a leash. She loves her leash and her harness so much that she licks them when we use them. 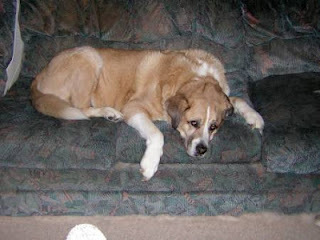 Harmony is a female Saint Bernard mix that is almost 12 years old and she weighs in at 86 pounds. She was adopted from a Humane Society in South Carolina in 2001. Harmony is an indoor dog that is housebroken, and she loves people, and is good with kids, once they have been introduced. She doesn’t like cats, but takes to strangers easily. Harmony has been contained in a yard with a four foot fence for most of her life and doesn’t jump. She is passive, and would let another dog eat her food with only a whine. She has a tendency to bark at unusual noises and new people (until she gets used to them) and paces and licks her arms when she is stressed. Harmony is used to having human company during the day, and has the run of the house, but she is not destructive, even when left alone. She has not been crate trained, it was never needed. She is heartworm negative and is currently on Tri-Heart Plus procured from Hanover Animal Hospital where she is a patient with her file under Kim or Harmony Sawyer. Harmony needs to find at least a temporary home by the end of the first week in September. She needs a new home because her owner is moving into a home, where no dogs are allowed.